Apparently I've been on a movie kick lately. My movie list of things to watch had built up so I'm swatting them down one by one. 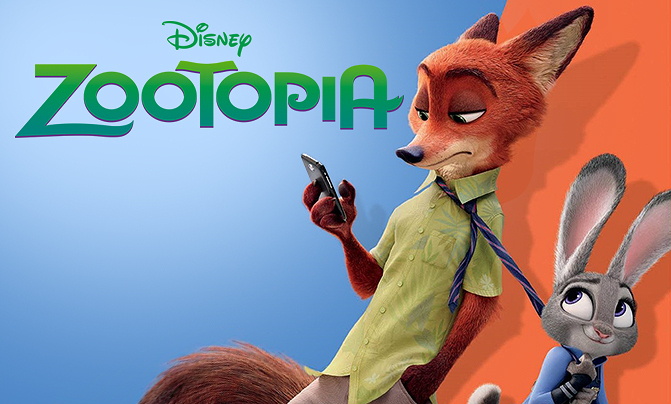 Anyway, Zootopia is a fantastic movie. I sat down to watch it by myself and by the 15 minute mark both my wife and my son had wandered by and got sucked in. We all loved it! The premise is that animals have evolved to live together peacefully and basically all act like humans do in real life. It deals with themes of stereotyping in interesting ways but mostly it's a good movie because the main characters are really interesting and the world is a marvel to find out about. I think Disney is just killing it lately with their movies. It seems like Disney CG animated movies are actually a lot better than Pixar these days. And I'm actually super happy with the way they're handling their big franchises like Star Wars and Marvel as well. So... yeah. I would basically recommend Zootopia to anyone. It's a great movie to watch, with or without kids!